Night with Gertrude. And Victor. Updated Dec 9th: Video added. Gertrude is an old lady. About 600 years old. 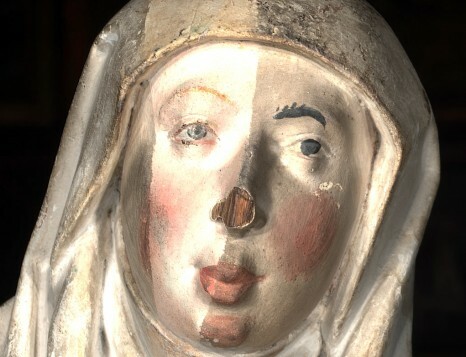 She is one of the wooden statues at the high altar in St. Nicholas’ Church, Tallinn. 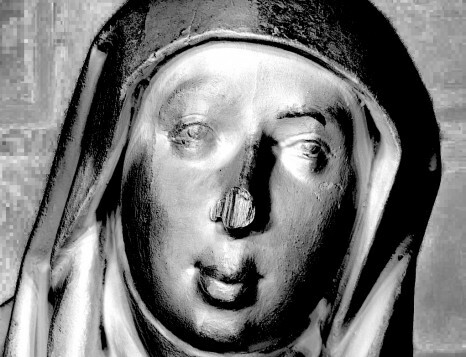 Gertrude is reviled to the public three times a year. Rest of the time she and other status are hidden behind the massive altar wings. Those altar wings are covered with medieval comic strip about life of St. Nicholas and St. Victor. 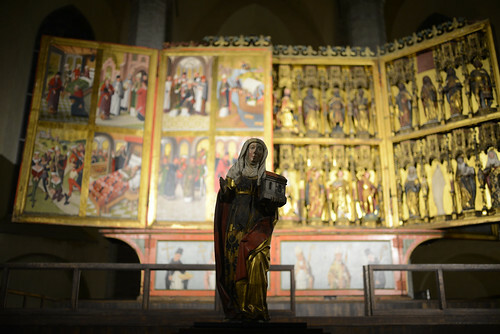 Altar is by Hermen Rode, artist from Lübeck, finished around 1481 AD. I spent few hours with Gertrude and Victor, and nice people from Art Museum of Estonia: conservator Hilkka, art historian Mari-Liis and MA student Kaisa-Piia from Estonain Academy of Art. I had with me RTI-kit and multispectral camera. RTI was a new technique to try on altar and it came out very nicely. You can see some screenshots here from the results. This was just a small test but the plans are much bigger. With multispectral camera we took photos of Decapitation of Victor. And we reviled some 600 years old secrets. Will write about that an other time. The plan is to document both altar wings using IR photography. Hopefully collaboration with Art Museum of Estonia will involve some other ACRG members in near future. Very exiting times. One Response to "Night with Gertrude. And Victor."